Kanon opens her show with a small discussion about the Winter Hello! Concerts. They are trying out a new type of performance style for DANCE MODE! (I’m assuming its the acrobatic performance shown at the beginning of this video). Kanon claims that she is considerably bad at it, however she affirms that the performances are very cool. There only Hello! Concerts every 6 months, so its really exciting to get to talk regularly for a little while with the other groups. 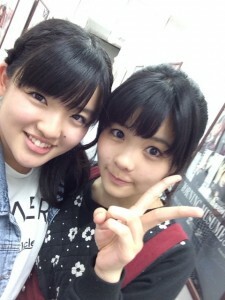 Angerme is Kanon’s favorite group to be able to see at Hello! Concerts. Recently she got to talk with Tamura Meimi, which Kanon appreciates as she think they have a lot to relate about since they are both 16. After talking with her, Kanon realized that Meimei has a firm vision for her future. It got Kanon thinking that she needs to create a vision for her future as well. She hasn’t really thought about it before, but the one thing that she definitely wants for her future is to continue in Morning Musume. From there, Kanon will build on what she would like her future to be like. The first message is very similar to something she answered on the last radio show here, so I will link you to it instead of writing about a very similar answer. With that, we’ll move on to the second message. Message 2: Otsukanon! Congratulations on getting a radio a show! It seems like you are good at making dessert, so I wondered what your favorite kind of desserts are. For Kanon, her favorite dessert is definitely cheese cake. During a bus event for Lilium, she had even made cheese cake for the staff/members. She says its really easy to make in a rice cooker and because it is so easy is why she can make it well. Recently, however, Kanon has made scones. Its a little early, but she decided to already try making things for Valentines day. She posted pictures of the scones on her blog, but everyone thought they were cookies. Overall, scones aren’t supposed to look like cookies so it made her sad that people didn’t recognize them. So, she is going to work towards making her scones look more scone-like for Valentine’s Day. Message 3: Otsukanon! I was surprised to hear you talk passionately about mushrooms. I eat my favorite mushrooms with bean sprouts and mince meat, I really recommend it. Kanon responds that she doesn’t have a special way of eat mushrooms. Sometimes her dad will make them with bean sprouts and egg or sometimes in nabe. She won’t go out of her way to eat them any certain way but does like them best when they’re mixed with lots of vegetables and meat. She hasn’t tried mushrooms the way the listener recommended, so she says she’ll try it. Message 4: Otsukanonsumairu! I have been listening to you show for a while now and you’ve mentioned having Sakura as a guest on the show a few times. However, I think it would be great if she became a semi-regular guest on the show, what do you think? Kanon thinks its frustrating for listeners to want Sakura to be on the show semi-regularly, as she is working hard to bring a good show every week by herself. It would be fun to have her on as a guest but semi-regularly would be hard for her to accept. Now for a story about Sakura: Lately, she has been voluntarily helping the 12th gen out by participating in what they are doing and assisting them, which Kanon thinks is great. The other day the two of them worked together with helping the 12th generation members and it led to Kanon realizing that Sakura has a unique way of teaching. She’s very good at coming up with things and then saying them properly out loud, which would make her an interesting guest to have on the show. But even after her praise of Sakura she still feels like “Why do I have to talk with her? Its annoying!”. But either way, we’re waiting for Sakura to come on the show! Kanon no Anata no Nayami ni LOW KICK! 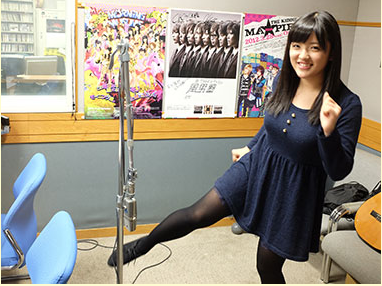 As a suggestion from a previous show, Kanon will give Low Kick style of advice. Trouble 1: I am jealous that Kanon doesn’t seem to have very many foods she doesn’t like. I hate most vegetables, especially when they’re raw. I wont eat celery, green peppers, cucumbers, etc. How do you like to eat your vegetables? I love Kanon so I am more likely to eat something you’ve recommended. In reality, Kanon doesn’t eat vegetables raw very often either, except that she’ll eat a whole cucumber every day of summer if she can. She recommends pairing the raw vegetables with other flavors, such as dipped veggie sticks in misomayo paste or mentaiko sauce. Personally, Kanon makes her own sauce with mayonnaise, ketchup and a few other things. She likes green peppers herself, but normally eats them with meat. She thinks that everything melds together in green pepper and meat dishes so the listener may be able to eat them if they put both in their mouth. For Kanon, she personally doesn’t like carrots, however one time her mother mixed tiny pieces of them in pancakes and because she couldn’t really taste them, it was ok. And with those recommendations on vegetables, Kanon gave their troubles a LOW KICK! Trouble 2: I recently got a cat and it will play with feet at night. Its cute, but it makes me really mad, but the cats so endearing I can’t do anything to stop it. What do you suggest I do? She is also charmed by cats endearment, she starts, then realizes she has never mentioned on the radio show that she has a cat. She frantically says “I have a cat, I have a cat!”. Her name is Bi-chan, and Kanon has a similar problem with Bi-chan. When Bi-chan makes a nuisance of herself and starts playing Kanon’s feet, she will firmly grab her cats hand and tell her “Stop!”. But even after Bi-chan has done something bad she will make a cute face, so its important to not fall for it. Kanon gave the troubled listener’s cat problems a LOW KICK! Kanon will kick your problems away!